These Morgan silver dollar coin rings are of the highest quality! Hand made from sharply detailed coins, each ring in the premium series is painstakingly finished with a stunning and durable patina. The rings in this series are among the finest silver coin rings available. Quality of materials and craftsmanship sets these rings apart from others. This is an exceptional ring and one you will be proud to wear or gift to someone special. An example of the "Low Profile" ring can be seen in pic #4. With the low profile Morgan ring, the thickest part is removed, the reed and letters along the top of the rim. 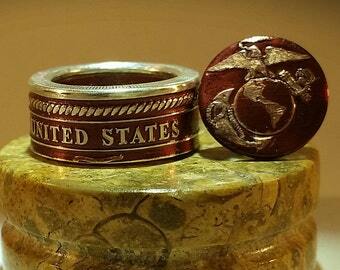 The phrase, "In God We Trust" is located higher on the ring and a greater part of the the American Eagle is displayed. 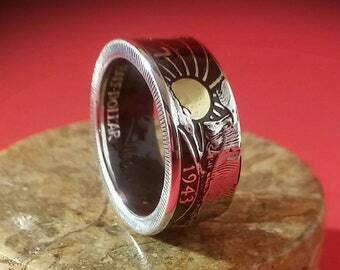 This is a thinner, more comfortable to wear, version of the classic Morgan coin ring. Please indicate in the comments section if your preference is for the low profile version of this ring. Also available in a thin band version (pic #10). Please indicate in the comments section which color you'd like (gold, blue, red, maroon, violet, green, fuchsia, rhodium, copper, orange, pink, turquoise, pine green, wine red, rose gold, chestnut brown and extreme black). Also indicate if you would like the coin's date to be on the outside or on the inside of your ring. THE SMALLEST RING SIZES ARE AVAILABLE FOR THIS COIN RING! Smaller sizes were never practical for this coin ring before now because the coin's details would be ruined in the forging process. If you always wanted a Morgan silver dollar pinkie ring or if you have smaller sized hands, this ring can finally be made for you, in whichever size you choose and with the coin's FULL DETAILS INTACT! About the coin: the Morgan Silver Dollar is one of the most famous and desired U.S. coins. It is composed of 90% silver. Morgan Silver dollars, named for their designer George T. Morgan, were minted from 1878 to 1904 and then again in 1921. The Morgan Dollar is the first American coin to feature an American-inspired Lady Liberty rather than one fashioned after the traditional Greek style images. These Silver coins also have an updated version of the American eagle shown carrying an olive branch and a bundle of arrows. About the ring: the Morgan Silver Dollar ring is a beautiful collector's item. Custom made to your specifications, the ring will be hand forged from a crisp, high detailed Morgan silver dollar. Your choice of a Nano-ceramic color or a proprietary patina will be applied. The details are carefully polished and treated with a scratch resistant Nano-ceramic sealant. Lifetime re-sizing and re-finishing are included in the price. You will be kept apprised, with photos and notes, during each step of the process while forging your ring. 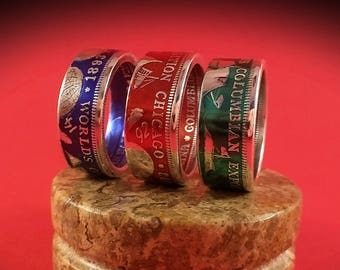 Extra time will be required to fill orders for rings in this series but they are usually shipped within 5 working days. Questions will be promptly answered. I do not recommend the extreme rounded sides or "fat tire" look for this ring. The fat tire shape looks good in photos but is is an uncomfortable ring to wear. 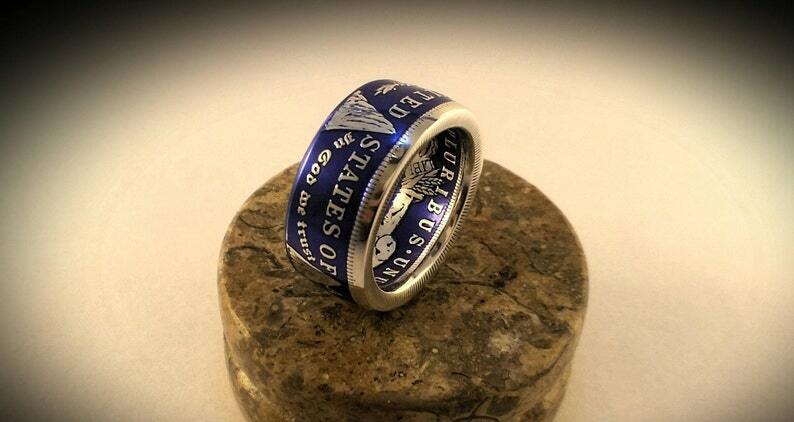 However, if you choose to have the ring made with the fat tire shape, that option is available. Please note: Premium Series rings are only available with a full patina (as seen in the photos). 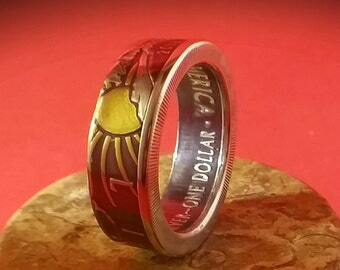 A less expensive Morgan silver dollar coin ring, with a partial patina or a plain, shiny finish is also available. 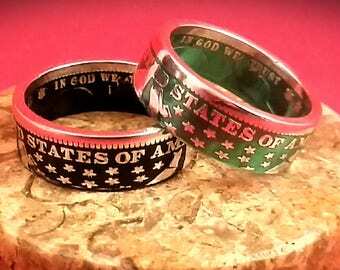 Please see my listing for the Select Series Morgan coin rings. Thank you.